If getting into the Indian banking sector is your dream, then you should apply for the upcoming IBPS clerk examination. The examination is conducted by the Institute of Banking Personnel Selection each year to fill the entry-level bank positions across all the nationalized banks, except SBI. 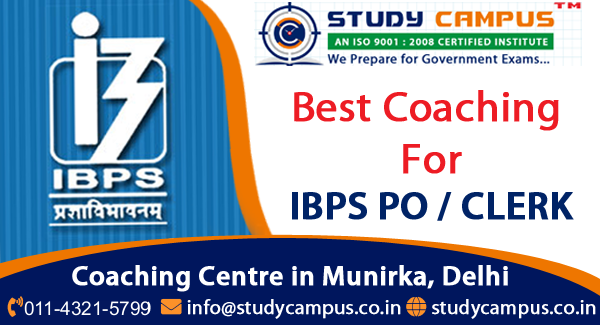 Students applying for the upcoming IBPS clerk examination should book their seats in a reliable IBPS clerk coaching in Delhi, Munirka to increase their chances of clearing the examination with flying colors. Preparing in the right direction not only increase your chances of clearing an exam but also increase your chances of scoring high marks. Our coaching institute located in South Delhi has prepared several students for the IBPS clerk examination and is considered to be among the top educational training institutes in Delhi by our students. Our tutorial is skillfully designed by industry experts to precisely cover all the topics included in the syllabus. We receive various inquiries from students related to different courses from areas like Hauz Khas, JNU, Saket, Ber Sarai, Malviya Nagar, and many others. If you want to channelize your time and efforts in the right direction, then join our premier IBPS clerk coaching in Delhi. Once you clear the IBPS clerk exam and join any one of the well-known nationalized banks, you can expect to rise higher with your hard work and experience. Most of the students that took the meticulously prepared coaching classes from our well-known IBPS clerk coaching in Munirka, Delhi are today working with some of the best-nationalized banks.